When the Museum opened in 1994, I was surprised how many visitors wanted to know what specific paint colours we used because they wanted to paint rooms in their own homes the same colours. Perhaps I shouldn’t have been surprised, having once coated my living room in colour best described as “chicken wiener”. It’s not easy to pick a paint colour based on paint chips alone. In any case, Museum staff have had almost daily requests. 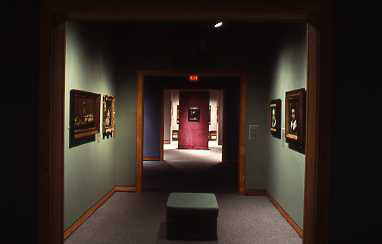 Particularly popular shades were those on the 4th floor gallery walls showcasing 16th – early 20th century paintings. For the record, here they are. All are from Pratt & Lambert.